As I have previously written on the blog and explain in Warnings, this spring marks the 40th anniversary of storm chasing. 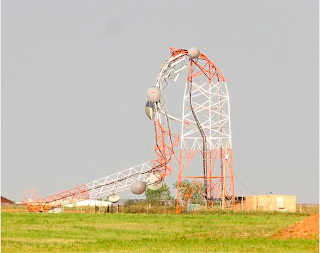 Storm chasing began with members of the University of Oklahoma student chapter of the American Meteorological Society chasing storms to support a radar research project at the National Severe Storms Laboratory. In rural Oklahoma in 1972, there were almost no McDonalds or Burger Kings or Wendy's. What you did have in every little town was a Dairy Queen. They were the walk-up design where you ordered at a little window and they handed you your cone or shake. A tradition developed that, if you caught a tornado (very rare in the early days of chasing, we didn't know what we were doing), you stopped at DQ to celebrate after the chase. While I cannot speak for other chasers, I've kept up that tradition. 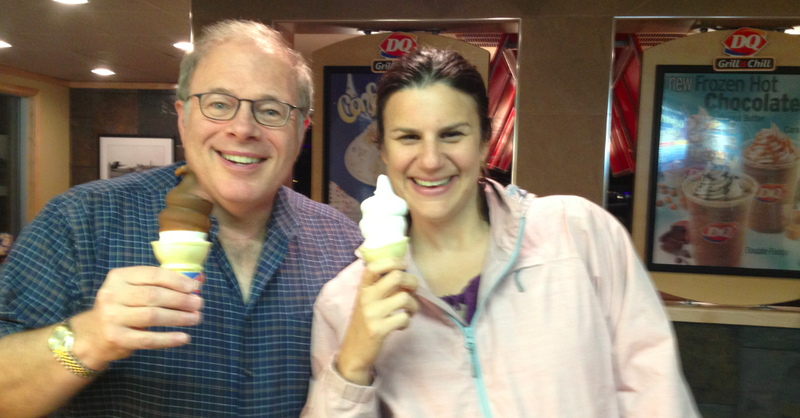 So, my chase partner Jaime Green and I had ice cream at the Dodge City DQ about 9:45 yesterday evening to celebrating seeing two separate tornadoes (as well an additional two funnel clouds). 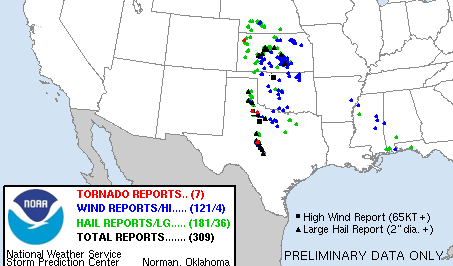 The tornadoes were, by far, my favorite type: In completely open country and harmed nothing. Those of you who have read When the Sirens Were Silent recognize Jaime. She and Denise Neil (her best friend) were returning from a wedding and were caught in the path of the Joplin tornado. Jaime is a photographer for the Wichita Eagle and was the wedding photographer that day. Both Denise and Jaime were shaken by the experience, so I offered to take them tornado chasing to explain that tornadoes just don't come out of nowhere as the people of Joplin have unfortunately been told. Denise was not able to come with us yesterday but Jaime and I had a great time. She is posting some of her photos from yesterday on her Facebook page as well as at the Eagle's web site. She also hopes to produce a videotape of the chase. If she does, I'll link to it on the blog. I'll have one more story about the chase that I'll post either tomorrow or over the weekend. It is about the fabulous new Big Well and tornado museum in Greensburg. Both Jaime and I were very impressed. I'll have photos and will give you a preview as to why you must go when you are in the area. Hail is the mortal enemy of ripe wheat. As we were driving toward Hanston to intercept the storm that would ultimately produce two funnel clouds and two tornadoes, I shot this photo of a field being harvested ahead of the storm (the storm is to my back). When people talk about the "green sky" associated with tornadoes, they are really talking about the presence of hail. This was one of the greenest skies I've ever seen. Hail and high winds were widespread across Kansas yesterday. The extent to which the wheat that remained in the fields has been damaged is unknown. 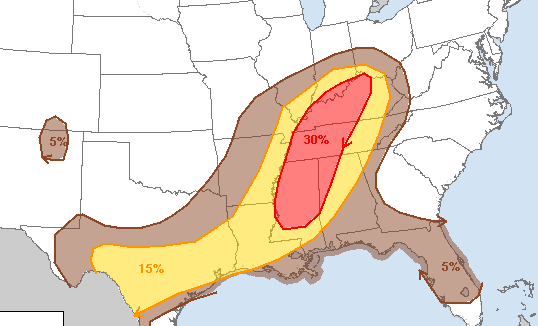 Today's primary threat is damaging winds over a wide area of the South. 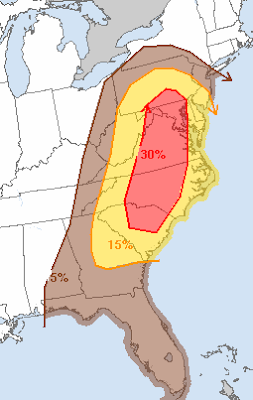 For tomorrow, AccuWeather's Henry Margusity is concerned about a tornado threat from south central Pennsylvania into West Virginia and western Maryland. The map is the SPC's forecast of all types of severe weather (tornado, large hail, damaging winds). Another strong endorsement for When the Sirens Were Silent. We bagged two of them this evening, both near Jetmore. 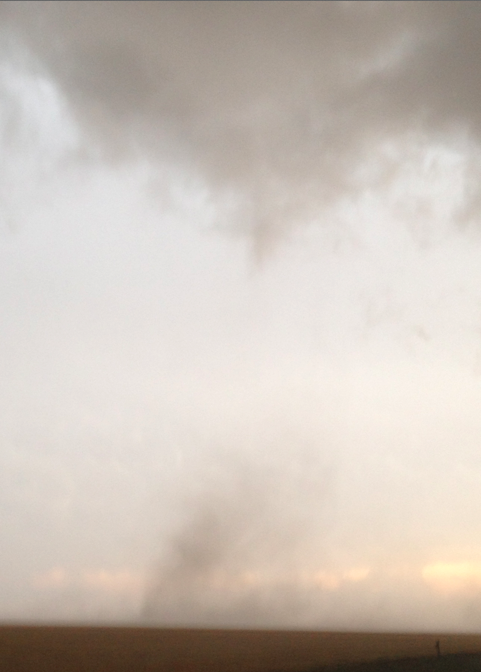 Because there are so many low hanging clouds, I've put an arrow on the tornado. We could clearly see the rotation. The second was about 5 miles south of Jetmore. I placed an arrow at the bottom of the funnel. Even though the funnel didn't get all the way to the ground, it is still a tornado due to the rapidly rotating debris cloud on the ground. Certainly hope you enjoyed the Tweeting of the tornado chase! P.S. We are in Dodge City having pizza and salad. Will go across the street to Dairy Queen and indulge in a 40-year storm chase tradition. DQ after bagging a tornado! Took the photo below from the Pizza Hut parking lot. By request, here is another image of the second tornado. It occurred at 7:35pm. Tornado watch for the eastern Texas Panhandle until 9pm. 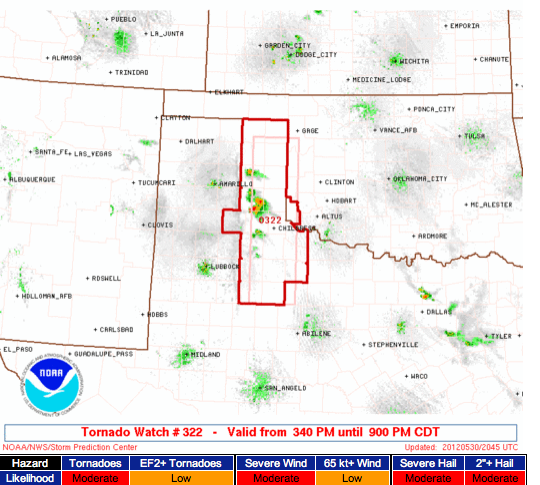 This is the first tornado watch of the day. We are in Greensburg waiting for the storms to fire in this vicinity. Just toured the three-day old new museum and it is incredible. I'll have a report on the blog tomorrow. I'm live-Tweeting (with photos) the chase @usweatherexpert. Feel free to follow us! Towering cumulus clouds are already making their appearance west of Wichita. I'm going to be storm chasing today and I'll be photo-tweeting it. You can follow me @usweatherexpert on Twitter or at AccuWeather.com on the internet. We have passed the Memorial Day Weekend, which is the official gateway into summer, so you can now wear white anytime and you can also pick-up both of Mike's books for some interesting summer reading. Mike's new book Sirens is dedicated to the people of Joplin and has been the #1 best seller at Watermark Books the first week out on the shelves. Sirens also contains the tornado safety rules on perforated pages to be torn out and posted to keep you safe at home, school and the workplace. I've spent most of the last hour reviewing the data. 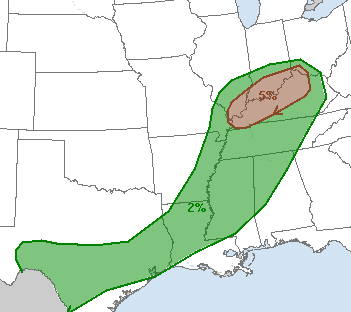 Here is the Storm Prediction Center's tornado outlook today. 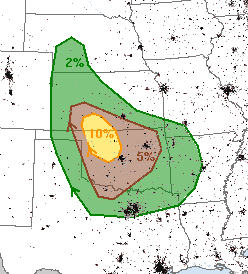 I agree there is a significantly elevated risk of tornadoes from Greensburg to OKC with the entire brown (5%) area at risk. The highest tornado risk will be in the general vicinity of the boundary of last night's rain-cooled air with the very unstable air to the south. Here is the current location of the boundary. An hour or two after the tornadoes, the thunderstorms should morph into a complex with widespread large hail and damaging winds. 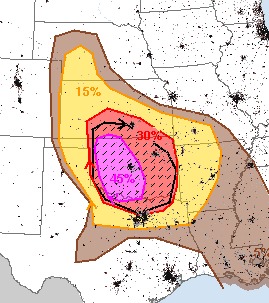 The hatched area is where winds of 75mph or more may occur. 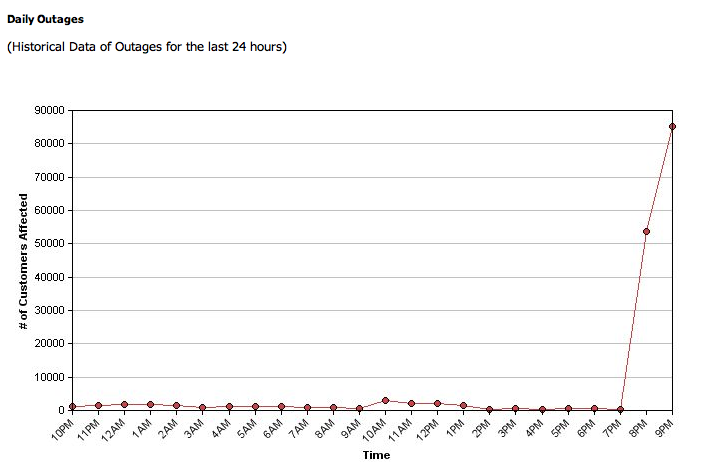 Obviously, widespread power failures, tree damage, etc. will occur in areas that receive winds of that intensity. This threat includes Wichita, Oklahoma City, Wichita Falls and Dallas-Ft. Worth. The probabilities refer to winds of 60 mph or more. 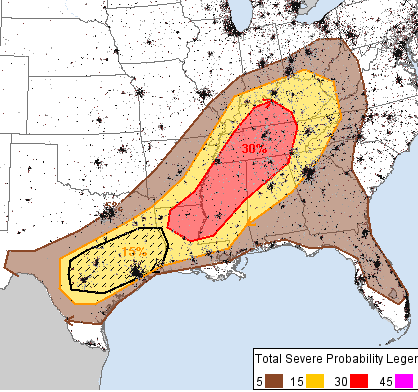 The probabilities refer to 1" or larger and the hatched areas expected to experience 2" or larger hailstones. Put your car in the garage. The severe weather threat migrates south and east tomorrow. 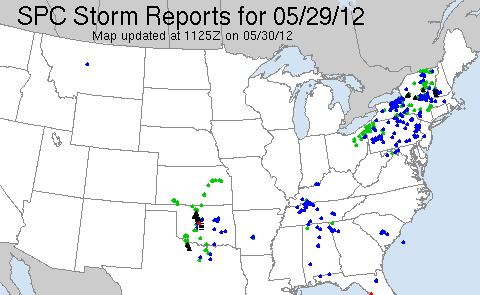 Literally hundreds of reports of large hail and damaging winds brought hundreds of flight delays and cancellations. The Albany Times-Union has details in that region. Vicious thunderstorms occurred in Oklahoma yesterday evening with softball-sized hail and winds of 70 mph or higher in a number of areas. Newsok is the source of the photo below and they have more details. 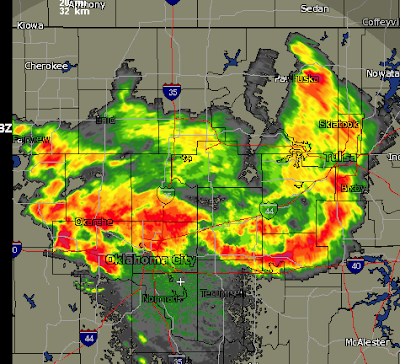 The day has dawned with heavy thunderstorms and flash flooding in Oklahoma City. 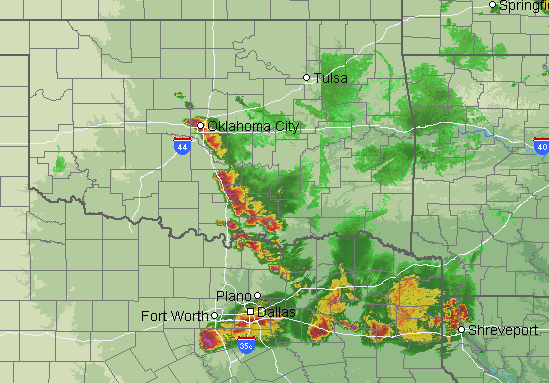 Other thunderstorms extend south along I-35 from Norman to Dallas. 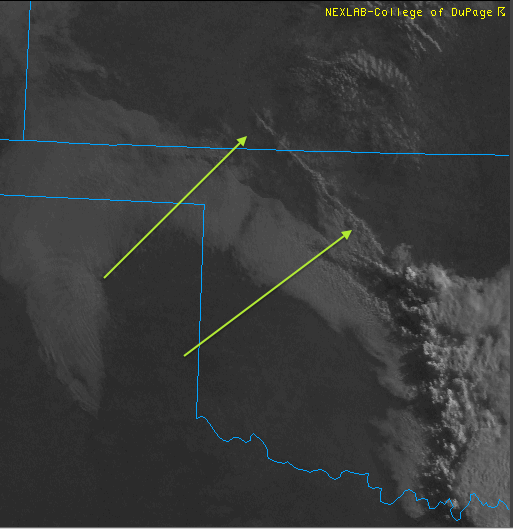 It is going to be another active day in the central and southern Plains. Please check back and I'll have a forecast up around 8:15m. When the Sirens Were Silent has officially been out two weeks. I welcome comments from readers and offer the opportunity to post them here. Photo taken from my back yard this evening. Been covering severe weather from north Texas to New Hampshire today and have some other things I have to do this evening. Hope the coverage has been helpful. Note: There is a significant threat of severe weather in the central and southern Plains Wednesday. Please check back in the morning for more information. 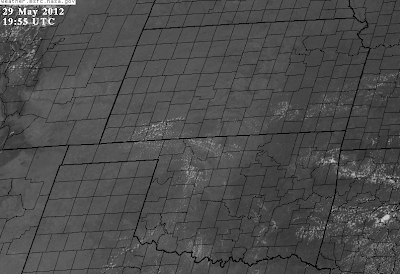 85,000 homes and businesses without power as of 9:30 this evening in central Oklahoma. That equates to about a quarter of a million people. 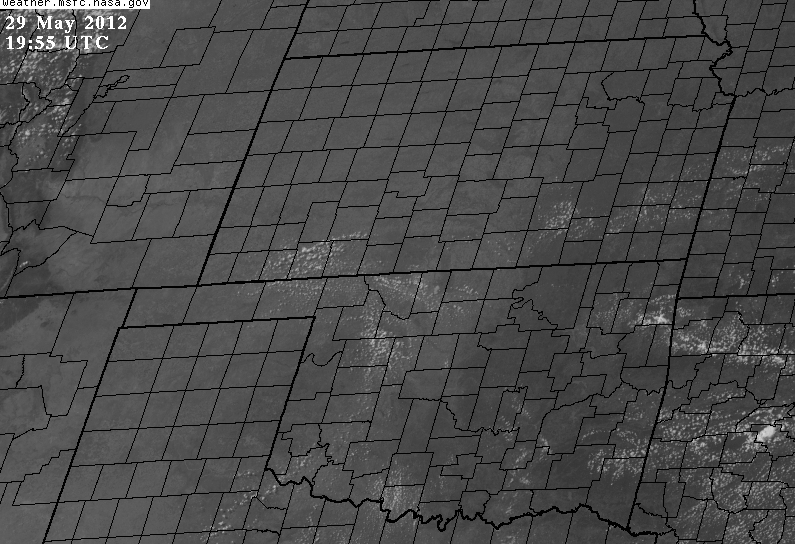 Number of homes and businesses without power in Oklahoma Gas & Electric Co. service territory. Widespread severe thunderstorms in central Oklahoma as of 9:08pm. Damaging winds and large hail continue to be likely as the storms move south and southeast. The orange pixel southwest of Guthrie is the radar measuring 90 mph winds! The radar is measuring the winds above the ground, so it is impossible to know if these are reaching the ground. 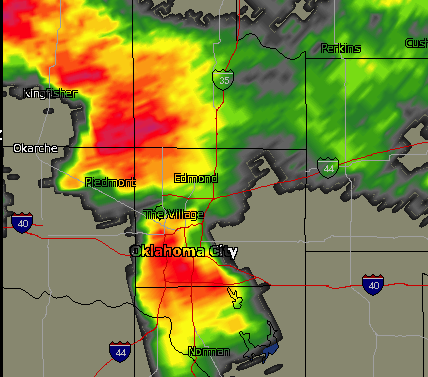 In eastern Oklahoma County, wind gusts of 60mph or a little higher are likely. Red polygon is the tornado warning. The hook (tornado) is moving southeast between Yukon and Piedmont. 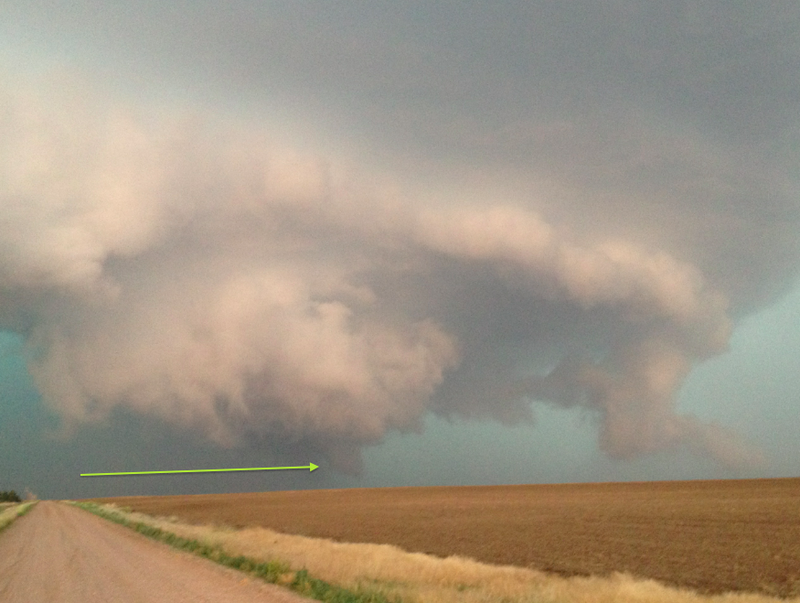 I have put an oval around the tornado's location. Tornado may be wrapped in rain and difficult or impossible to see. 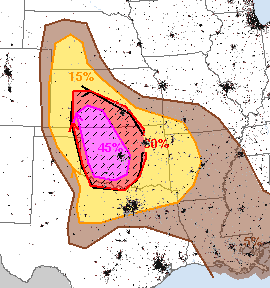 Giant hail is still a major threat with the large hail indicated in purple. The southern storm is moving northeast. The northern storm is moving southeast. UPDATE: 9:30PM. 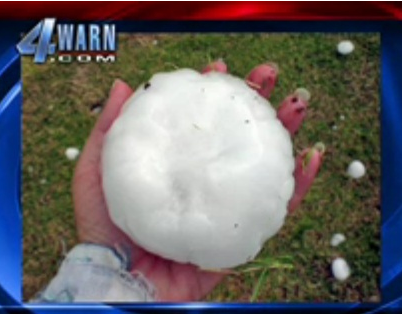 Photo of one of the giant hailstones via KFOR TV. 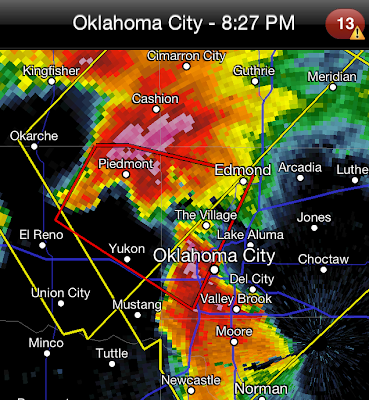 Hail up to softball size is moving into Oklahoma City from the north. Damaging winds also possible. How a Meteorologist Looks at a Cumulonimbus: A thunderstorm is actually a cumulonimbus cloud which is comprised of an updraft (yellow) and a downdraft (blue arrows). 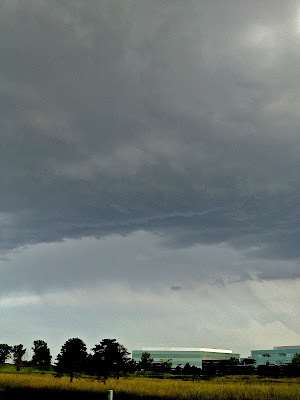 At my home, we could feel the rain-cooled outflowing air from the storm that spreads out once hit hits the ground (just like the water spreads when you spill it on the kitchen floor). 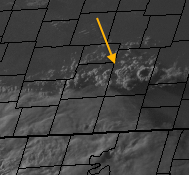 You cannot see this thunderstorm's anvil since I'm looking toward the east, but it shows up nicely on the satellite picture (arrow). Finally, here is the radar image of the storm at the same time (8:00pm). 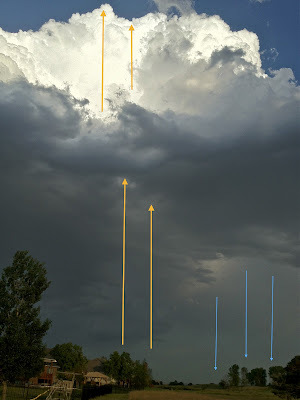 The orange arrow denotes the thunderstorm in the above two images. The green arrows highlight the light green line which is the rain-cooled air from the storm. 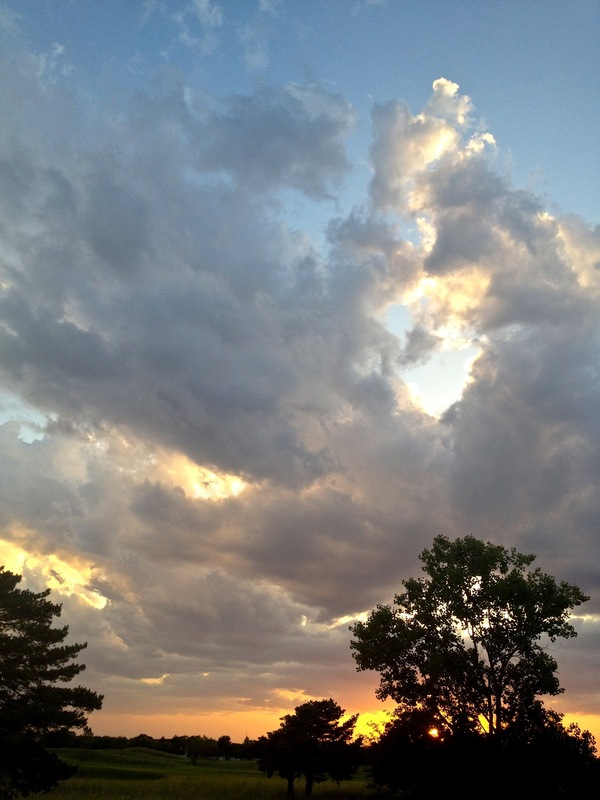 You can learn a lot about weather and short-term forecasting just by watching the clouds. Compare to posting immediately below. 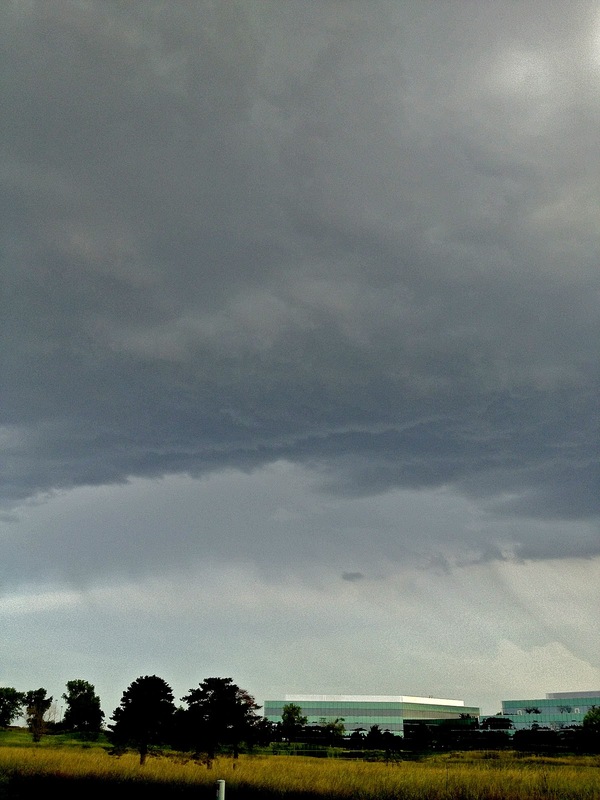 The radar and cloud photos are less than 5 minutes old. The cloud east of my home has now turned into a thunderstorm (see arrow on radar image). And, here it is on radar. The eastern arrow points to the cloud above. 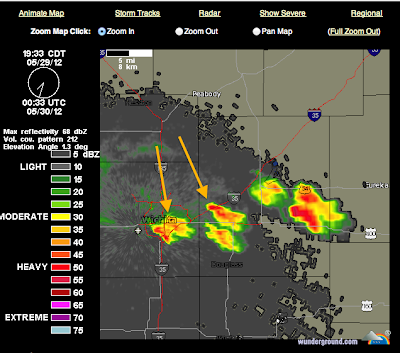 The western arrow shows the radar echo associated with the thunderstorm in the photo below. 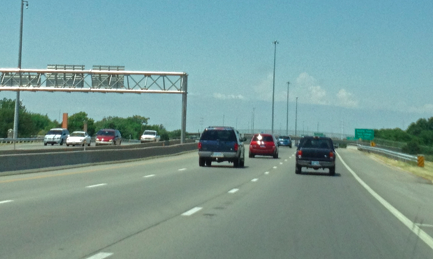 You can see the rain streaks below the cloud base. From my backyard, the clouds are beginning to swell along a weak wind shift line. One or two these will turn into thunderstorms. The same cloud is indicated by the yellow arrow with another likely area for thunderstorm development near the orange arrow. Satellite image from 6:02pm. 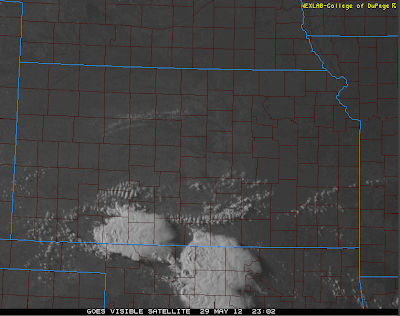 Line of clouds east-west into southern Sedgwick Co. might be an area where more thunderstorms start to form. There is a severe thunderstorm watch until 11pm from far northern Texas into southern Kansas. Note there is a moderate risk of hail 2"in diameter or larger with a high risk of 1". There is also a high risk of winds of 58 mph or higher. Radar shows strong thunderstorms moving southeast across northern Oklahoma. Yellow polygons are severe thunderstorm warnings. AccuWeather continues to cover the Northeast tornado and severe weather threat: @breakingweather . 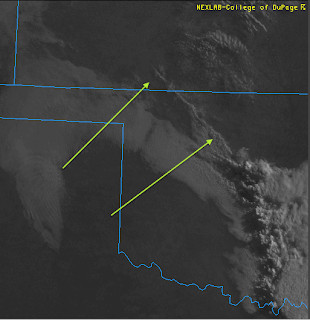 Current weather satellite imagery indicates clouds starting to tower upward in southwest Kansas and northwest Oklahoma. 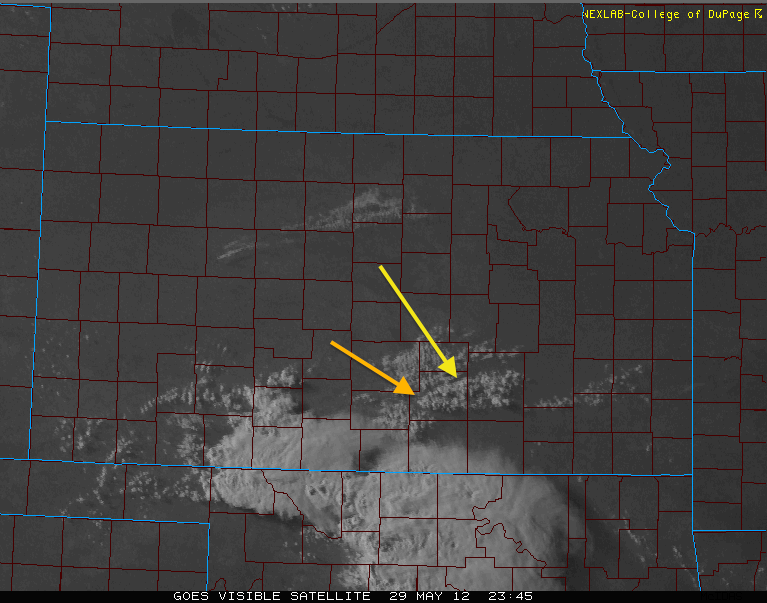 Other clouds are gathering in the southern Flint Hills. The NWS Storm Prediction Center believes that tornadoes, damaging thunderstorm winds and tornadoes are possible over this region. 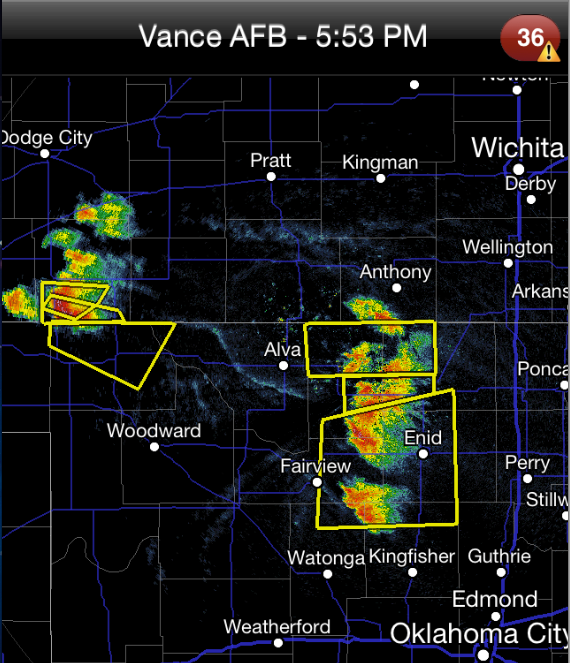 Storms should develop over southern Kansas and western Oklahoma during the next hour or so. 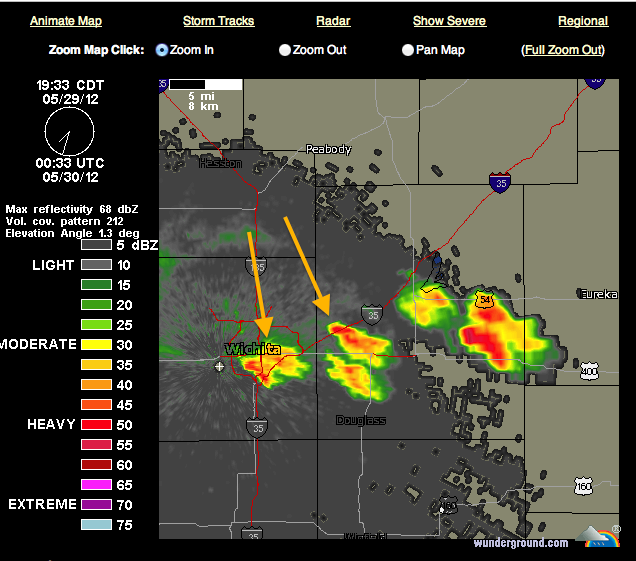 The map below indicates (hatched) where hail 2" or larger will develop. If you live in the yellow or red areas, please keep up on the weather starting around 4pm and into this evening. TORNADO-producing thunderstorm at arrow tip. 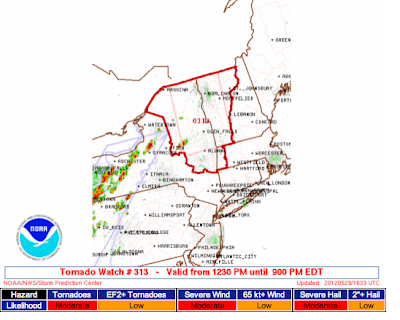 Tornado warnings out for four Vermont counties. 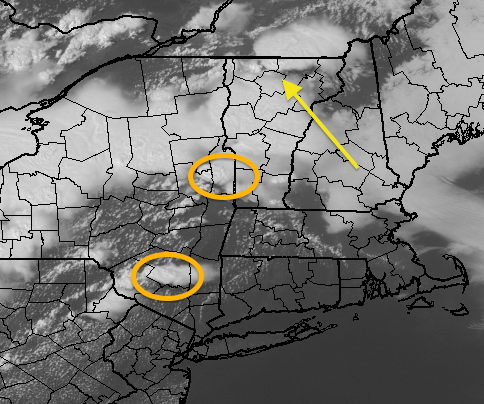 Keep a close eye on the two circled thunderstorms as eventual tornado candidates. Tornado warnings are out on the two cells indicated by yellow arrows. 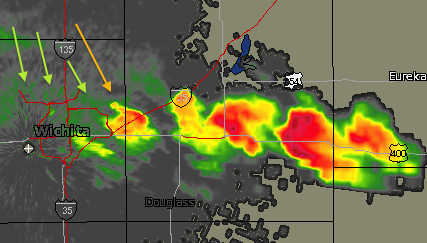 The cell I've circled in gray is suspicious and should be watched carefully for possible tornado development. 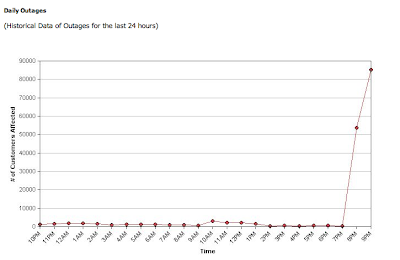 I'm noticing that there is relatively little internet traffic about these storms. If you know someone in these areas, please make sure they are paying attention. There are serious air travel issues as BOS, NYC and PHL's normal routes to CLE, ORD, MDW and DTW are blocked by the storms. My Airline Crisis Survival Guide is here. Red = tornado warning. Amber = severe thunderstorm warning (large hail and/or damaging winds). Yellow is a tornado watch and maroon is a severe thunderstorm watch. Warning = immediate precautions needed. 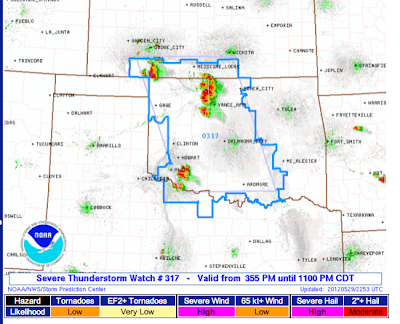 Watch = watch the weather and monitor weather information in case threatening weather develops. Twitter's @breakingweather is AccuWeather's stream of up-to-the-minute info. There are flight delays all over the region, please check before heading to the airport. I'm going to let my Pennsylvania colleagues take over this storm. I'll be blogging about the central U.S. threat as it develops later today. Please pay attention if you live in these areas as well as adjacent areas of Quebec and far southeast Ontario. Tornado safety rules are here. FYI: My new book, When the Sirens Were Silent, has convenient lift-out copies of the tornado safety rules for home, school, and work. The first watch of the day. Please note the risk of large (≥1") hail and thunderstorm winds ≥58 mph is "high." AccuWeather is Tweeting these storms @breakingweather . WABC TV, New York: Review of "Sirens"
Updates: "When the Sirens Were Silent"
Johnny Carson Retired 20 Years Ago Tomorrow? 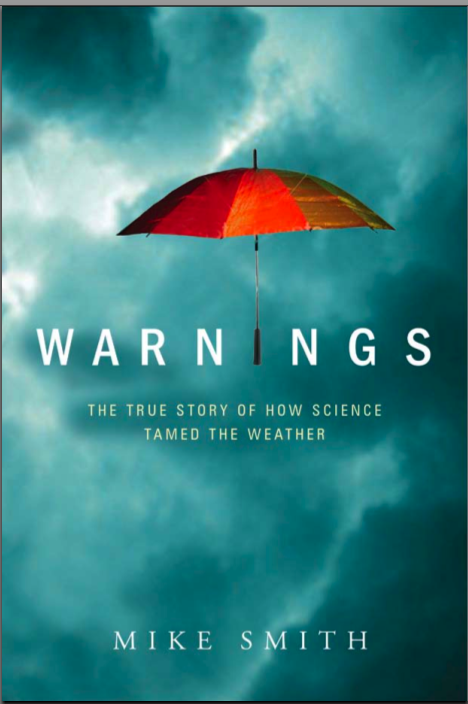 Three New Reviews of "Warnings"
The Kindle Version of "Sirens" is Out! Are We Spending Too Much on "Climate Change"?